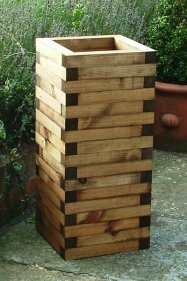 The Tallboy, is one of our tall planters, and adds height and presence to your planting dispay. 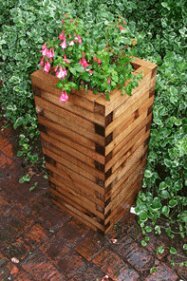 The floor of the planter is 30cm from the top of the 'tower', so you don't need to fill the whole planter with planting medium, although the floor height can be adjusted on request. These tall planters are made from lengths of 4.5cmx4.5cm Scandinavian red pine (the best quality pine) which are joined, glued and treated with a high quality, plant friendly and water repellent preservative. The Tallboy weighs over 25kgs so it very stable even in strong wind. The internal walls of these planters are now painted with a waterproof paint sealant. A group of well-chosen planter grown vegetables can produce a stunning display, since many common vegetables have surprisingly pretty foliage. The feathery leaves of carrots, tall dark plumes of blue sweet corn and green-maroon foliage of beetroot are as pleasing as those of many herbaceous perennials. You can also have fun when planting vegetables in planters. Forget the neat drilled lines of the kitchen garden. When vegetables are going to be grown in full view - on the patio or balcony, for example - you can experiment with original ways of growing them. The dramatic foliage of a courgette always commands attention, but it looks doubly arresting leaning tipsily out of a slanted wooden planter. Beans are another plant that planter gardeners can have fun with. Both beans and peas are easy to grow in planters and offer pretty flowers before the crop ripens. Dwarf and green beans can be left to sprawl over the side of a planter. appear at the base of sweetcorn plants; they are essential for healthy development and stability. The cobs are ready to eat when the sap in the kernels is the colour and consistency of milk. mini-turnips. That way the ornamental look of your planting will not be spoilt. You can grow root vegetables in all sorts of planters. Round and baby varieties of carrot need only a few centimetres of Compost so may be cultivated in troughs; a long rootedd variety will need a deeper root run. Choose varieties that mature quickly, such as the carrot' Early Nantes 5'or Beetroot 'Pronto'- so you can raise a second crop in the same season. Or choose carrot 'Autumn King' which takes all summer to develop, giving you the maximum display of foliage.